Eruptions of Taal Volcano, that picturesque but deadly killer within a lake in the Province of Batangas, have been previously featured in Batangas History, most notably those of 1749, 1754 and the more recent one of 1911. The 18th century was a particularly active one for reputedly the world’s smallest active volcano. There are no less than nine eruptions on record1 for the 1700s at the official web site of the Philippine institute of Volcanology and Seismology (PHIVOLCS). The eruptions of 1749 – which forced the evacuation of the lakeside pueblos of Sala and Tanauan – and 1754 – which sealed off a channel linking Taal Lake to Balayan Bay and altered the topography of the province – were perhaps the more spectacular. It is, however, to the less-written about eruption of 1716 that we now devote our attention. PHIVOLCS describes this violent eruption of 1716 as of a phreatomagmatic nature marked by the expulsion of tephra, a violent base surge, the occurrence of seiches and emission of toxic gases2. Let us all first begin to understand these terms. A phreatomagmatic eruption is one when magma – molten or semi-molten rocks from underneath the surface of the earth3 – interacts with water, such as those in Taal Lake4. Tephra, also called pyroclasts, are volcanic fragments expunged into the atmosphere by an eruption, anything from boulders to ash5. Base surges or pyroclastic surges, meanwhile, are blasts that surge outwards from the source of the explosion close to the ground. This phenomenon, similar to what happens during a nuclear blast, was first recognized by volcanologists observing the 1965 eruption of Taal Volcano6. Finally, a seiche is similar to a tsunami except that it occurs in an enclosed body of water such as a lake6. PHIVOLCS has previously identified five major eruption vents or cracks in the earth from which lava can erupt. There are actually more, and the institute states in its web site that there are 47 craters in Volcano Island alone7. 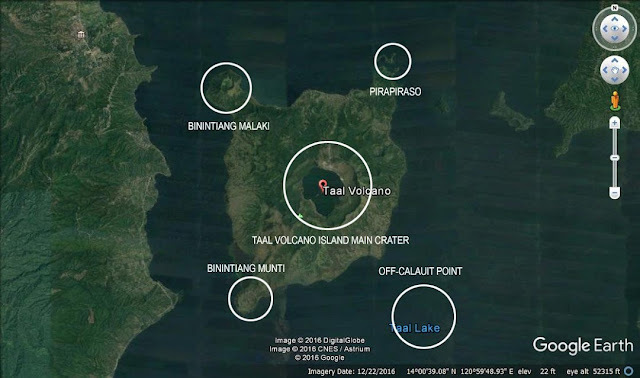 For the purposes of this article, let us devote our attention to the southeastern corner of Volcano Island, otherwise known as Calauit Point, just above the white circle in the figure below. Image source: Google Earth, with superimposed information form PHIVOLCS. It is at this area that the volcano erupted on 24 September 1716. It was likely this eruption, along with another one from Binintiang Malaki (see figure above) in 1729, that convinced the inhabitants of the pueblo of Lipa – then in what is presently Tagbakin – to move away to what is now Lumang Lipa, a barrio of Mataasnakahoy. The eruption was described by the Augustinian friar Manuel de Arce in a narrative which was actually copied from an earlier document entitled “Actas de Taal8.” The account is presented verbatim below, extracted from a 1912 edition of The National Geographic magazine9. “On September 24, 1716, at about 6 o'clock in the evening, a great number of detonations were heard in the air, and shortly after it became plain that the volcano in Lake Bombon had burst on its southeastern side, which faces Lipa, so that the whole point called Calauit appeared to be on fire. 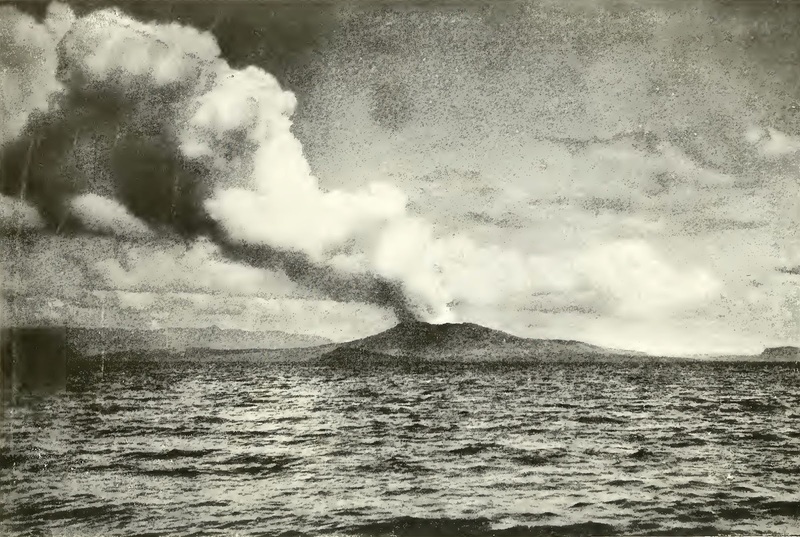 Later on the eruption seemed to spread into the lake, in the direction of Mount Macolod (Maculot), which rises opposite the volcano on the southeastern shore of the lake. Great masses of smoke, water, and ashes rushed out of the lake, high up into the air, looking like towers. Simultaneously there was a great commotion in the earth which stirred up the water in the lake, forming immense waves which lashed the shores as though a violent typhoon were raging. Their fury was such that in front of the Convento of Taal, and in other places of the beach, a strip of more than 10 brazas [16.7 meters] in width was engulfed by the water, and the church was endangered. “On the following days, Thursday, Friday, and Saturday, things continued in the same way, but by Sunday all the combustible material appears to have been consumed. This eruption killed all the fishes, large and small, the waves casting them ashore in a state as if they had been cooked, since the water had been heated to a degree that it appeared to have been taken from a boiling caldron. There was an all-pervading, pestilential stench of sulphur which greatly molested the inhabitants of the towns surrounding the lake. 1 “Eruptions,” online at PHIVOLCS. 7 “Taal Volcano,” online at PHIVOLCS. 8 That de Arce copied the narrative was according to the Jesuit Saderra de Maso. “History of Taal's activity to 1911 as described by Fr. Saderra Maso,” online at Institut Für Angewandte Mineralogie und Lagerstätenlehre. 9 “The National Geographic Magazine: an Illustrated Monthly, Volume 23,” published 1912 in the United States of America.